His message: “It’s a game.” Play football to get an education and a degree. Will you learn anything? Probably not. Crazy as it sounds, Dr. Bryan Caplan is on the same page as coach Brown. What makes college worth it--signaling. 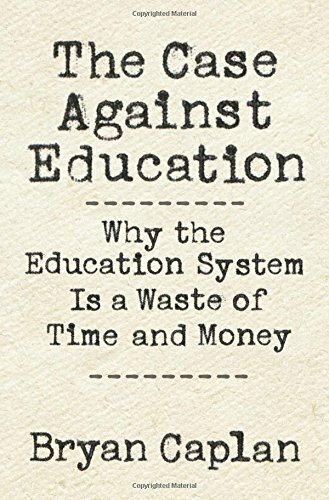 In his outstanding book “The Case Against Education: Why the Education System Is a Waste of Time and Money“ professor Caplan rejects the idea that all education teaches useful job skills and those job skills pay off in the labor market. Instead, we learn our job skills on the job. A degree signals that students have the discipline to suffer through the boredom to conform to what society expects and what employers want. You don’t use history or math on the job, unless you are a math or history teacher. “First and foremost: from kindergarten on, students spend thousands of hours studying subjects irrelevant to the modern labor market,” writes Kaplan. He can train Ph.D. students to be economics instructors, but the rest? “I can’t teach what I don’t know.” Most of Kaplan’s students will go on to have careers far away from economics. Students don’t want skills, they want credentials. “Employers could have substituted standardized tests for traditional diplomas a century ago. They didn’t,” Kaplan writes. Kaplan spends much of the book debunking the human capital theory of education. Students never complain when an instructor cancels class, but if instructors were truly building student’s human capital, students would demand a refund for every cancelled class and the knowledge capital they should have received during that class period. “Do we really transform waiters into economic consultants---or merely evaluate whether waiters have the right stuff to be economic consultants?” Kaplan wonders.